Siberian Storm™ is an online video slot machine game released in October 2011. It is offered exclusively at online casinos powered by IGT (International Game Technology). This video slot game has 5 reels and 720 ways to win per spin! The theme of Siberian Storm is inspired by the marvelous and majestic beauty of Siberian tigers that hunt in the harsh climate of the Siberian wilderness (where food is actually very scarce). Siberian Storm™ is regarded as one of the top-performing slot machine games from IGT land-based casinos from 2010, and a lot of slots players greatly anticipated its release online because they would like to enjoy playing this game’s fun-filled MultiWay Xtra™ Feature, with up to an astounding 720 ways to win on an impressive hexagonal 5-reel interface that pays in both directions (left to right, and right to left), which means more ways to win per spin! In case you didn’t know, the MultiWay Xtra™ Feature is a trademark of IGT. Online slots games are very fun and exciting to play at once you have got a taste of its free play mode, and that is what’s great about IGT because they let interested players to play instantly on any of their online slot games, without requiring them to download. Every person who plays land-based casino slot games will surely know about the Siberian Storm slot game, because it features Stacked wild symbols, Stacked bonus symbols, scatter wins, a Free Spin Bonus Feature game that gives you an initial of up to 96 Free Spins and up to a max of 240 Free Spins per bonus game, a Top Prize of $/£/€ 250,000 for a single bet, a MultiWay Xtra™ Feature which lets you have 720 ways to win per spin, and last but not least, it has a 92.52% to 96.00% theoretical average RTP (return to player)! IGT brings to the online world slots games that could only be found before at land-based casinos, and Siberian Storm is surely going to be one of your favorite online slots games to play at because it features not only the majestic beauty of Siberian tigers, but also its richness in rewards, slots-style! The background setting of Siberian Storm somewhat looks like the environment is made up of ice, since in Siberia where the tigers live, the climate is mostly considered as a wintry subarctic one. The symbols used in the game perfectly complement the theme such as the Siberian Tiger in its normal coat and the other one is in its winter coat (white), and other parts of the Siberian Tiger made into ornamental jewelry (tiger eye necklace and tiger claws). You will most certainly love its animated programming whenever you get winning combinations. The overall graphic design of Siberian Storm showcases a wide variety of vibrant colors including blue, green, purple, red, pink, orange, black and a whole lot of white! Adventure-themed background sounds that will surely pump your adrenaline will be heard when you spin the reels. 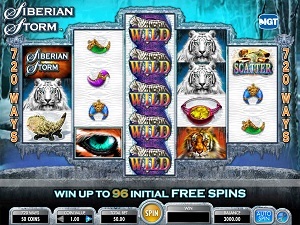 The brightly-colored symbols included in the Siberian Storm online video slot game are greatly matched by entertaining nature-themed sound effects whenever you form winning combinations, especially the Siberian tiger itself, in which you will hear its mighty roar, making your gameplay all the more fun and interesting. There are no card deck symbols used in the Siberian Storm online video slot game. The symbols that you will see in the Siberian Storm online video slot game are the Siberian Storm Logo, the Siberian Tiger, the White Siberian Tiger, the Tiger Eye Necklace, the Siberian Tiger’s Canine Tooth, the Blue Tiger Claw, the Purple Tiger Claw, and the Green Tiger Claw. The Wild Symbol is the Wild Siberian Tiger. The Wild Siberian Tiger symbol acts as a substitute for all other symbols (with the exception of the scatter symbols) in order for you to complete winning combinations. The Wild Siberian Tiger symbol can only be found on the 2nd, 3rd, and 4th reels in the main Siberian Storm online slot game, and can come out stacked. It is possible for up to 5 Wild Siberian Tiger symbols to appear on a reel at the same time per spin, which makes this a Wild Siberian Tiger wild symbols Stack. Please take note that the Wild Siberian Tiger symbol does not substitute for the scatter symbols (Tiger’s Eye and Gem Stones) in the game. There are 2 Scatter Symbols in the Siberian Storm online slot game, and they are: the Tiger’s Eye and Gem Stones. The Gem Stones scatter symbols are not required to appear in an active pay line for you to win. • The Gem Stones scatter symbol can be found anywhere on the 5 reels to form winning combinations, as long as there are 3 or more Gem Stones scatter symbols that come out. Your winnings will be calculated via multiplying the Gem Stones scatter symbol combination payout (refer to Paytable) by the total number of coins you’ve bet. • By getting a Tiger’s Eye scatter symbol in any position on 5 consecutive reels, you will activate the Siberian Storm Free Spin Bonus Feature game. Please take note that if you obtain a scatter win and a regular win, you are paid out for both of these winnings, because the Gem Stones scatter symbols in this game are not required to come out on an active pay line for you to win. Scatter awards are entirely independent from pay line awards, thus they are included to the pay line win. Siberian Storm Free Spin Bonus Feature Game – If you manage to hit 5 Tiger’s Eye scatter symbols (scattered in any position on 5 consecutive reels), you will activate the Siberian Storm Free Spin Bonus Feature game. Once activated, you will be given a prize (for each winning combination of 5 Tiger’s Eye symbols) plus 8 Free Spins. Because of the fact that there are stacked Tiger’s Eye symbols, it is possible for you to get up to 96 Free Spins initially! The reels in the Siberian Storm Free Spin Bonus Feature game are much richer – there are more Stacked Wilds than in the regular Siberian Storm slot game. While in the Free Spin Bonus Feature game, you can re-trigger the Free Spins again by obtaining 5 Tiger’s Eye scatter symbols (scattered in any position on 5 consecutive reels). Each winning combination of 5 Tiger’s Eye symbols gives you a prize and 8 extra Free Spins. You can actually re-trigger the Siberian Storm Free Spin Bonus Feature game many times, up to a max of 240 Free Spins per bonus game. The extra Free Spins are included to your remaining number of Free Spins. In the Free Spin Bonus Feature game, the Wild symbol that appears on the 2nd, 3rd and 4th reels can appear stacked. When the Siberian Storm Free Spin Bonus Feature game is over, you will be taken back to the main Siberian Storm online video slot game, and your winnings acquired from the Free Spin games are included to your overall balance. Siberian Storm has 5 reels (3 x 4 x 5 x 4 x 3) and 720 bet ways to win on every spin! The minimum bet is 0.50 and the maximum bet is 150.00 per spin. You can wager 1 coin per pay line. It is absolutely more fun and easy when there is an Auto Spin function available in online slot games. In Siberian Storm, you can access their Auto Spin function by clicking on the (blue) Auto Spin button on the lower right corner of the screen. You are given the choice of how many spins you would like the game to do automatically for you – from as low as 10 up to as high as 50. When you choose a number, say 30, the Auto Spin function will keep track of the remaining number of automatic spins. The Auto Spin will stop only when a Bonus is triggered or the balance is insufficient to spin again. Also, you are actually given the option to stop the Auto Spin yourself, just in case you want to.